I recommend that we all ask yourselves some or all of these questions...every now and again..
Is it because we are all competitive? Is it because we love the water? Is it because we love boats? Is is because sailing is relaxing? Do we strive to win? Do we want to get away from it all? Is it to be at one with the wind? Is it to be consumed by nature? Is it the challenge of batttling the elements? Do we have money to burn? Did our parents force into sailing and we daren't stop? Is it because our friends do it? Is it because of the friends we make doing it? Does it make a great excuse to get drunk? Does it let you be at one with yourselves? Is it the team work? Is it for the trophies? Is it an excuse to travel? Does it enable you to see the world..
Do you love to make things go fast? Do you want to have a hobby? Do you want some skills to pass down to your kids? Is it for the tactics? Is it because its like chess on the water? Is there nothing better to do? Do you like the openess of the ocean? Do you want to be in a club? Do you like salt water? Do you want a natural rush? Want to be totally calm? Why the hell do you go sailing? Because I can't play golf! I'm going to take up golf when I'm too old to sail. So that means we will never see you on a golf course. 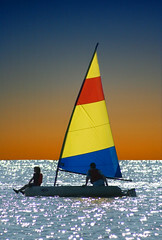 Cause sailing is something you can do until the very day you die!